Process engineers responsible for managing biomass gasification plants will find the ST75 Series Air/Gas Flow Meter from Fluid Components International (FCI) operates in hot, wet, dirty environments to provide highly accurate measurement of mixed composition gases, including: hydrogen (H2), carbon monoxide (CO) and trace methane (CH4). The ST75 Flow Meter operates over a wide flow range in mixed gas environments from 0.01 to 950 NCMH, depending on line size. For variable process conditions such as those in biomass gasification plants, the ST75 meter is factory preset to a turndown range of 10:1 to 100:1. With built-in process temperature compensation for accuracy, the precision ST75 Flow Meter maintains consistent performance in rugged, hot biomass gasification plant environments. It features highly dependable accuracy to ±2% of reading with ±0.5% repeatability in line sizes from 6 to 51 mm. Ideal for crowded equipment areas in biomass gasification plants, the insertion style ST75 Flow Meter features remote mounting capabilities for hazardous plant environments. The transmitter, which includes a full digital display, can be mounted up to 15 meters away from its thermal mass flow sensor in the process piping and connected via two 0.50-inch FNPT or M conduit connections. Offering direct-flow measurement for higher performance at a lower cost with proven thermal dispersion technology, the ST75 Flow Meter eliminates the need for additional pressure and temperature sensors, flow computers, or other devices that are required with orifice plates, Venturis, Vortex shedding, and other volumetric meters. 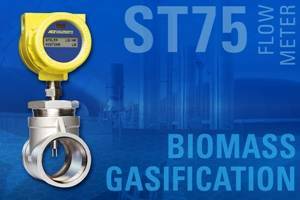 The ST75 meter also requires virtually no maintenance for both a low installed and low life-cycle cost.